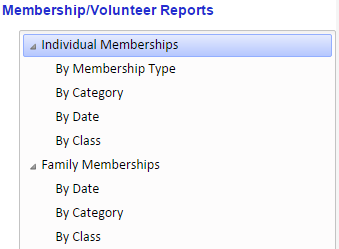 There are quite a few reports for your membership reporting needs. Membership Type (for individual only): this option will allow you to view memberships by parent, student or faculty specifically or report all. If you report all, the report will group by type. Date: enter the from and to date. Note that if you do not track membership dates, this option will not yield any results. Class: this is a super handy report if you want to see what percentage of parents in a class are members. Some schools use this for membership contests during their membership campaign.